Posted on September 29, 2017 at 2:40 am. Japanese Prime Minister, Shinzo Abe, calls October 22 election. 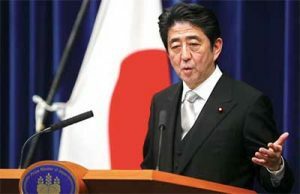 Prime Minister, Shinzo Abe, has announced a snap election casting doubt over the future of a regulated Japanese casino industry. Prime Minister Abe is taking advantage of the political climate, with an increase in public support, and opposition disarray. As a result, he dissolved the lower house during Thursday’s morning meeting. The October 22 snap election means the Integrated Resorts (IR) Implementation Bill, set to be discussed during the autumn legislative session, won’t be addressed until 2018, along with a problem gambling bill. The passage of the IR bill, which outlines the rules and regulations of the country’s integrated resorts featuring land-based casinos, will also be affected by the campaigning schedule, set to kick off on October 10. While Prime Minister Abe did not need to call for an election until December, if he has chosen the right time to call one, his coalition’s two-thirds’ majority would give him a chance at achieving his goal of altering the national constitution. It would also enable a clear path for the IR bill, which has been in the works ever since the Diet lifted a ban on casinos in the country. Supporters of the bill hoped the regulatory framework would be implemented by the end of the year, allowing for international operators to then apply for a license. But problem gambling issues, the pachinko industry and hesitation by the public to openly accept casino gambling in the country set its progress back. An expert panel recently toured several regions of Japan to convince the public of the benefits of IRs, and the casinos, which includes boosting tourism and attracting foreign investment. The two pieces of legislation, required before casinos licenses can be allocated, will still be discussed – it will just be much later than originally planned. “The delay may be helpful if it allows all sides to re-evaluate the most recently discussed proposals that would have a negative effect on market potential,” he added. When the regulatory framework is introduced it is expected two casino licenses will be granted, with one set for Tokyo and the other for Yokohama or Osaka. Casino floors will likely be limited to 15,000 square metres and gambling will be taxed at a 22 percent rate. There may be a limit on how many times locals can enter a casino, and they may have to pay entry fees depending on the guidelines set out in the problem gambling bill. Looking for an online casino to play at in the meantime. Players from United States can head to Slots.lv for a real money gambling experience which is secure and entertaining at the same time.